FRISCO, Texas (July 2, 2018) – US Youth Soccer is proud to announce the 14 champions of the 2018 US Youth Soccer Southern Regional Championships, and commend their success in the state and regional championships of the US Youth Soccer National Championship Series, the country's most prestigious national youth soccer tournament. 14U Boys VHSC Steamers 04 Black Vestavia Hills, Ala.
15U Boys 03 PTFC Black High Point, N.C.
16U Boys 02 NCFC Elite Raleigh, N.C.
17U Boys PPA KSA 01 Pro-Profile Atlanta, Ga.
17U Girls Mandeville SC Lakers LPDL 01 Mandeville, La. 18U Boys Davie United Sharks 2000 Blue Davie, Fla.
18U Girls Sunrise Sting 2000 Sunrise, Fla.
19U Boys Tampa Bay United Tampa, Fla.
19U Girls AFC Lightning 99 Elite Peachtree City, Ga.
Of the 14 total champions, North Texas led the way with four Southern Regional Champions, while Florida had three winners and North Carolina and Georgia each had two. Texas South, Alabama and Louisiana round off the list with one champion each. Regional Champions in the 13U through 19U age groups now advance to the third and final stage of the quest for the National Championship. These Southern Regional Champions will join the 40 National League qualifying teams as well as the champions from the Eastern Regional Championships, Midwest Regional Championships and Far West Regional Championships for the National Championships in Frisco, Texas, July 23-29. The US Youth Soccer National Championship Series is the country's oldest and most prestigious national youth soccer tournament, providing approximately 185,000 players on more than 10,000 teams from US Youth Soccer's 55 State Associations the opportunity to showcase their soccer skills against the best competition in the nation while emphasizing teamwork, discipline and fair play. The National Championships cap a yearlong series of competitions, US Youth Soccer National Championship Series, for boys and girls teams in multiple age groups as teams earn their way from the top teams in their state to the regional championship tournaments. US Youth Soccer State Champions, US Youth Soccer Regional League Champions and selected wildcard teams are eligible to compete in one of four US Youth Soccer Regional Championships. The champions in the 13U through 19U age groups from each regional event will converge in the finals in Frisco, Texas. 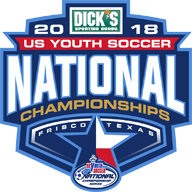 The US Youth Soccer National Championships will consist of US Youth Soccer Regional Champions in the 13U through 19U Boys and Girls age groups as well as the US Youth Soccer National League qualifiers in the 14U through 18U Boys and Girls age groups to complete the field of 96 teams. This year, live broadcasts of games will be available from the championships on the official website including daily reports and complete results. About the US Youth Soccer National Championship Series – The US Youth Soccer National Championship Series provides more than 10,000 teams from US Youth Soccer's 55 State Associations the opportunity to showcase their abilities against the best in the nation while emphasizing teamwork, discipline and fair play. The yearlong competition begins with over 185,000 players in the US Youth Soccer State Championships. These champions and selected wildcard teams, through US Youth Soccer Regional Leagues, advance to compete in one of four US Youth Soccer Regional Championships. Champions (13U through 19U) from each regional event advance to the US Youth Soccer National Championships. The 14U through 18U Boys and Girls age groups have four teams representing the US Youth Soccer National League. Overall, the US Youth Soccer National Championship Series provides the nation's top collegiate coaches with the premier stage to identify and scout the most coveted players in the country. For more information, visit http://championships.usyouthsoccer.org. Media Request: When referring to the US Youth Soccer National Championship Series, the most prestigious event in youth sports, please refer to the event as US Youth Soccer National Championship Series on first reference and National Championship Series on anything thereafter. Never refer to as NCS or USYS NCS. We appreciate your cooperation.